When I attended the Garden2Blog event last spring at P. Allen Smith's Moss Mountain Farm outside Little Rock, Arkansas, one of the sponsors was Le Creuset. Each attendee was allowed to choose one item from their catalog to try out after we returned home. Prior to this, I'd not owned a single piece of Le Creuset cookware, but I'd kind of drooled over the wok. I love Asian food, so the wok seemed like the best choice to me. I've used it quite a few times since I got it and yes, it's ridiculously heavy, but I have to say that I actually like that about it. With the bottom being small in relation to the rest of the pan, the weight is a stabilizing factor as I stir-fry in it. Not only that, because it's enameled cast iron, you can use a lower setting on your stove to maintain a specific level of heat. I chose red, because that's my favorite color. Last night, I decided to get ambitious and make some lettuce wraps, P.F. Chang's style. I looked up recipes online and what I came up with for mine was a combination of several versions I found, improvising when I didn't have exactly what the recipe called for. No matter - the result was something that we both LOVED, in fact, Romie loved it so much, he ate three of them. Mix all the ingredients for the dipping sauce together and whisk well. Set aside. Cut the chicken breasts into small cubes about the size of game dice. 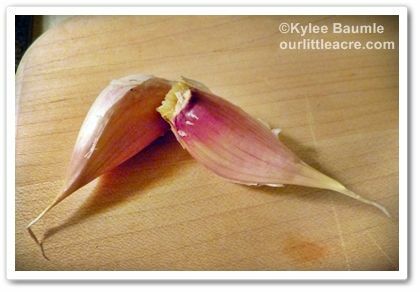 Prepare the mushrooms and water chestnuts by dicing those, and mince the fresh garlic. 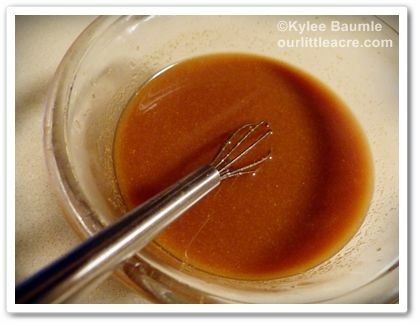 Mix the stir fry sauce in a small bowl so it's ready when you need it. 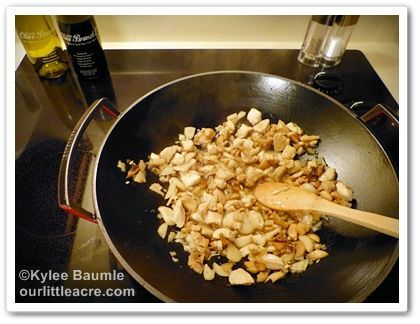 Put 3 Tablespoons oil in the wok and turn heat on high. Add the chicken and sauté it. If there's any liquid from the chicken, drain it off. Add the onions, garlic, water chestnuts, and mushrooms, stir, then add the stir fry sauce and sauté for several minutes. Take each leaf of lettuce and put several tablespoons of chicken mixture in the middle, fold each end in, then roll it up lengthwise. 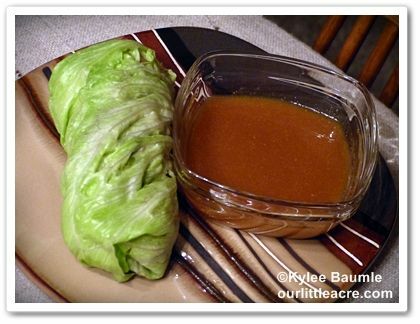 You can dip the lettuce wraps in the dipping sauce, or you can just pour it over the wraps on a plate and eat with a fork. Thank you to P. Allen Smith and Hortus, Ltd. for the opportunity to attend Garden2Blog, where all expenses were paid, as well as to Le Creuset for the free wok. Oh, YUM! The wraps look scrumptious--and I think we have a lot of those ingredients. I might just know what's for dinner now! Yay! Thanks so much for sharing, Kylee. And I dream about visiting Moss Mountain Farm--it looks so amazing. Yum! Thanks for the recipe. We have a wok my hubby bought in Chinatown in SF. I need to try this recipe out on him. Like Julie, I dream of visiting Moss Mountain Farm. Enjoy! You really can't beat Le Creuset (if only it were easier for me to remember how to spell)! I have a dutch oven, and use it for everything from chili to close-roasted meats. I'm so jealous of your new wok. I have yet to own any Le Creuaet but, like you, I often do a bit of drooling. Hubby would love this recipe. He's a huge fan of lettuce wraps with dipping sauce. 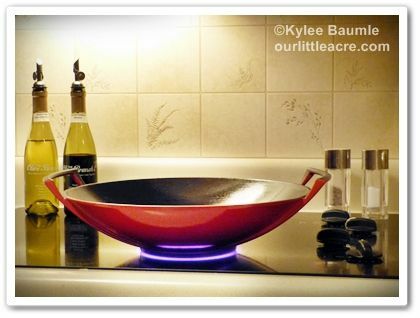 We may have to take the plunge and get a Le Creuset wok just so we can make the wraps.